writer/director/actor Paige Morrow Kimball gently discovered her great idea during a 3am bout with insomnia. Instead of fighting the sleeplessness, tossing and turning for hours, she decided to surrender. Feeling the need to temporarily escape and lose herself, she headed to her TV and hoped for a good movie, one that was remotely relatable to her life as a mother of two young children, in her 40s. When she found there were no Diane Lane films, she realized her chances for escape were dismal. The truth is that we are funny, dynamic, deep, sometimes raunchy, sometimes angry, sometimes sad, sometimes scared, REAL women in the prime of our lives with so much to say. 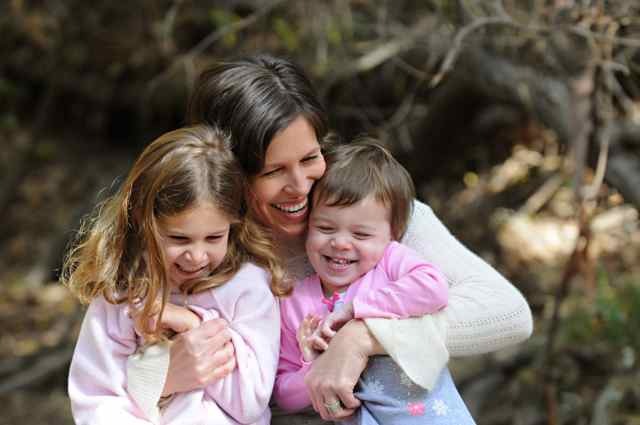 We're so much more than our children's mothers or our husband's wives. We're anything BUT boring! Where are our stories? Indeed, where are the stories that center around women in their 40s? Instead of just lamenting the lack of 40-something female protagonists in media who are funny and fully dimensional, Kimball a former TV producer, took action. So she wrote, directed and produced, Ending Up, a short female buddy comedy about four women in their 40s. dumped for an older woman? Well at least you're not a cliché. I'm 42. Single. And bitter. Ending Up reflects Kimball's belief that women can be both funny and vulnerable, as the film juxtaposes off-color comic moments with parts that are deeply emotional. And the powerful women of the film are not just onscreen. The film's producers, as well as the assistant director, editor and film composer, are all women. "That was an important part of making this film, creating opportunities for women like me who are 40 plus with children as well as young women building their careers in the business," explains Kimball. "The creative environment of our set centered around childcare, and pregnancy. One of the lead actresses, Ericka Kreutz, was really 8 months pregnant. Our kids played together in the background as we sat at my dining room table and had production meetings." And for Kimball, realizing that she had so much to share about this stage of her life offered great personal growth. "It's a gift that I will leave my two daughters," offers Kimball. "I hope that the stories remind them that we never stop learning. We only evolve and become more and more layered." I asked Kimball to tell me more. Q: What was the greatest challenge making the film? Paige Morrow Kimball: There were so many reasons to NOT make the film. The greatest challenge was just letting go of all the fears and the pre-conceived ideas of what the results of the film "should be." I knew that whatever the result, we would learn so much from the experience. This is also one of the themes of the film: letting go of where you think you're supposed to be in your 40s and appreciate the journey. Q: Why are there so few films for women post 40? Paige Morrow Kimball: From the business aspect, I think there's a misconception that women don't go to the movies as much as adolescent boys. But you have to look at what came first: the chicken or the egg? Are we not going to movies because we don't like going or is it that there aren't many movies we want to see? I also believe that there is a misconception that we are boring when we've already fallen in love, and have had babies. That somehow there are no stories to be told. In fact we've become incredibly interesting, and layered. One of my favorite films this year was Woody Allen's Blue Jasmine. He's always had such a depth of understanding about female characters in his films. Q: You cast some great actors in the film. How did they follow your vision for the film? Paige Morrow Kimball: The actors on this movie taught me so much. They all got completely on board with my vision and brought so much of themselves to the project. And each one of them was so unique and worked differently. When I saw actress Jenica Bergere in Safety Not Guaranteed, I knew she was my leading lady. Once she got on board she became a producer and asked her friends to read for me. She brought Sadie to life in a way that I never thought possible. She has such a great sense of story and she was an integral part of creating Sadie's character arc. Q: What did doing the film teach you? Paige Morrow Kimball: Besides everything? It taught me to not take a no for an answer. I got several in the process. It taught me that anything is possible if you really try, believe in something and stay true to yourself. It taught me not to ask, "Why"? but instead, ask "Why NOT?" I've learned to question the status quo and find a new way of looking at things. Q: What about film makes you most proud? Paige Morrow Kimball: I'm proud that I created four female characters who are over 40, strong and funny! There are not too many roles like that out there. I'm proud of the message of the film, that says, it's not too late -- that we can get through tough times and start over in the middle. I'm also proud of my working collaboration with my producing partners (Jenica Bergere and Kathleen Minogue Keagy). and that all of the key positions on the film were filled by women (except for the DP, David Speck who had an amazing visual sensibility not to mention a definite feminine side!). I'm proud that it's getting into some great festivals. Q: What has been the response so far? Paige Morrow Kimball: I'm so happy that audiences laugh at the jokes! They say they were touched at the end and they leave saying they wanted more. What could be better than entertaining people, and watching them laugh through their tears? It's the ultimate to be able to express myself as an artist and be able to impact people in a positive way, touching a place that resonates inside of them. Paige Morrow Kimball: The film will be making its festival premiere at the DC Shorts Festival, September 19 - 29. You don't have to go to DC to see it. You can buy tickets for an on-line screening while the festival is going on. It also will be at the San Jose Shorts Festival in October and we were invited to both NY and LA SAG Foundation Shorts showcases where the response from the actors in the audience was overwhelmingly gratifying. Paige Morrow Kimball: I'm in development on a coming of age story called Late Bloomer, about a 13-year-old girl and her newly divorced mother both coming into their own in the summer of 1974. It's a very autobiographical project that's close to my heart. I'm also writing a comedic romp about Peri-Menopause. I like the idea of tackling a subject that many others are afraid to tackle! 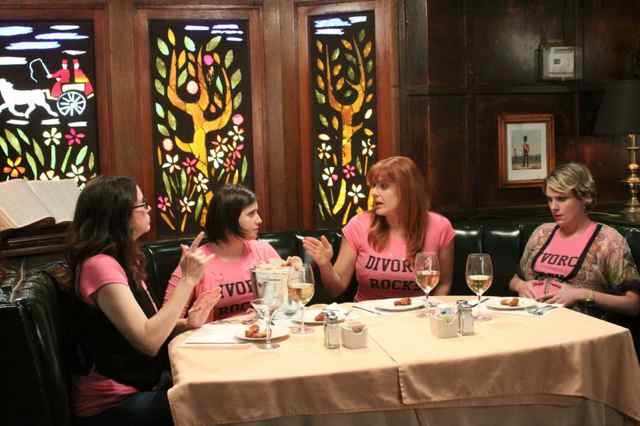 Amy Farrington as Terri, Melanie Paxson as Blair and Jenica Bergere as Sadie and Ericka Kreutz as Maddie at the Divorce Celebration in Ending Up. 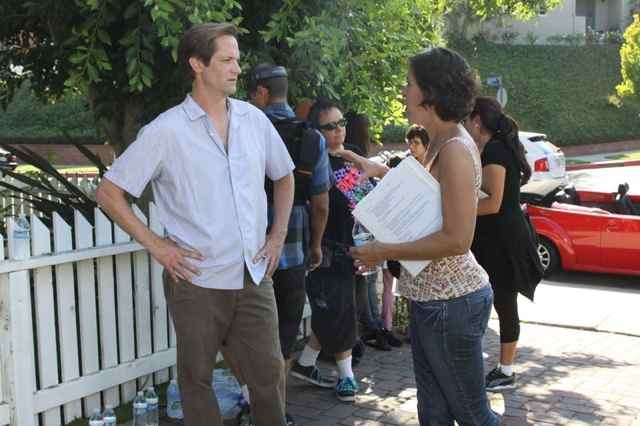 Paige Morrow Kimball directs Matt Letscher as Paul, in Ending Up.